Today (Monday): Mostly sunny with highs stretching into the lower 50s. Overnight Monday Night: The first batch of showers arrive just after midnight. Otherwise, mostly cloudy with lows in the 30s. Tomorrow (Tuesday): Rain, heavy at times, starting as early as the morning commute and lasting through the evening. Breezy with gusts nearing 30mph. A fantastic Opening Day is on tap across New England today as high pressure dominates, bringing another sun-filled day. 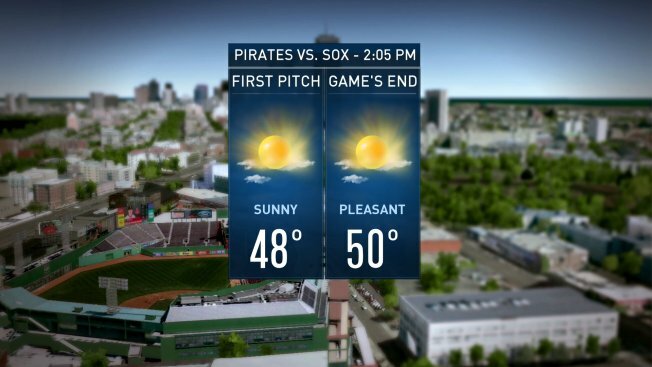 The Boston Red Sox take on the Pittsburgh Pirates at 2:05 p.m. with temperatures in the upper 40s by first pitch and reaching into the low to mid 50s by game’s end. As far as the rest of New England, highs will reach into the low to mid 50s south, with a few locations in Connecticut hitting 60. Northern New England is remaining into the upper 40s, but today will be another full day of snowmelt before another round of wintry mix and snow approaches for Tuesday. Tonight, clouds begin to build in as our next weather maker approaches from the Ohio Valley. Rain will hold off until after midnight before spreading west-to-east across the region tomorrow morning. Lows will fall into the mid to upper 30s. Rain, heavy at times, will be with us for most of Tuesday, dumping at least 1 – 2” of rainfall in southern New England. Northern New England, especially into the higher elevations of northern New Hampshire and Maine will likely see a wintry mix in the afternoon, changing over to snow by late afternoon into the evening. These snow showers will linger through the overnight hours with likely up to a foot of snowfall in the mountains of northern NH & Maine. Otherwise, we’ll see 3-6” for the rest of Maine and New Hampshire. A Winter Storm Watch has been issued for northern N.H. and Maine from Tuesday morning through Wednesday morning in anticipation of this late season winter storm. We take a brief break on Wednesday before another system slides in by Thursday, bringing another soaking rainfall. With all of the snowmelt and rainfall from this past weekend, to the upcoming high precipitation events on Tuesday and Thursday, minor flooding is possible. As we look ahead towards the end of the 10-day, it looks like some 60° warmth is on the way, slightly above normal for a change. Be sure to download the NBC Boston and necn apps to stay up-to-date, on-the-go with the very latest updates to your forecast.